I installed my first "good" Beverage Antenna in the early 1970's. I was delighted to find a large improvement in weak-signal reception from such a simple, inexpensive antenna. Over the years I've continued to use, compare, and refine my Beverage antennas. Despite having very large vertical arrays, arrays of Beverages remain my primary DX receiving antennas. There isn't any other receiving antenna that is as simple, as easy to construct and maintain, and as foolproof as a Beverage! The only disadvantage is the physical length required, and the physical headaches associated with having a very long antenna. I constantly refine my antenna systems by comparing systems against each other for extended periods of time, usually more than a year. My station has a convenient switching system allowing instant comparison of antenna systems. When an antenna system is almost never used, I abandon that system and try something else. Even though I use engineering tools (books and models), I always compare and measure actual working systems. I presently have over thirty Beverages in three different clusters of arrays, the end result filtered through years of measurements and A-B testing of systems. This control panel selects antennas for each receiver in the K3. The far left switch is for the main receiver which goes to the left ear, and the next switch left goes to the sub receiver which is the right ear. The K3 is the only standard transceiver system offering true diversity. Other receivers advertise it, but the claims are false! To have true stereo diversity each channel must have an identical phase-locked receiver. The filters and everything else must be identical, and all adjustments must track. The small push button panel changes directions. A great much has been written about Beverages. Unfortunately much or most information is a repeat of previously published information (and misinformation), from verbal discussions, or from other articles or handbooks! It is time to set aside some of the myths that have been handed down and repeated so much they have become "fact". The most commonly used wire types are single conductor hook-up or electrical wire, electric fence wire, and special antenna wire such as copperweld. The only significant and easily noticed difference between these commonly used wires is in physical properties, such as ease of soldering, strength, and life. We will occasionally hear or read claims that insulation prevents charged droplets of water from making an antenna "noisy". I've never been able to verify that rumor either in A-B tests of actual antennas or through planned experiments. Other reports, many from reliable sources, also seem to discredit this rumor. One of my experiments was to charge a stream of water (against earth) with an extremely high voltage supply, and spray the water on a wire. Other than corona noise from sharp points, the type of wire (bare or insulated) made no difference at all in "noise". The charged water droplets were not discharging into the wire like hundreds of random charged capacitors, they generated no detectable noise at all. This is really what we would expect, if we consider that each drop contains only a very miniscule amount of change and also has nearly perfect insulation (distilled water is a very good insulator). Controlled observations support the idea that corona, and not charges in individual droplets, actually cause precipitation static. In Ohio, my long Beverages stretched across open farm fields. Snow would whip across the fields, rain would pelt the wires, yet insulated and bare wire Beverages running in the same direction always had the same noise level. Beverages that picked-up corona (or "p-static") noise were always near or aimed at tall towers. With corona sizzling at 40-over-nine on my tall towers, Beverages (and even small "magnetic" loop antennas) aimed at the towers would "hear" the same precipitation noise. The same was true for tower-mounted antennas. The largest noise problems came from antennas mounted high on towers, and generally were with antennas that had "sharp" ends jutting out in the air. Lower antennas, even those of identical construction, were either significantly quieter or totally free of precipitation static. This effect was reported many times by contest operators and DX'ers with stacked antennas. They universally switch to low antennas to eliminate or reduce p-static, even though the same moisture is hitting the lower and upper antennas. This strongly indicates precipitation static is from corona discharge, and not from charges in each individual drop of moisture hitting the antenna. After my move to Barnesville, Georgia my first antennas were all insulated wire. Hook-up wire was pressed into service in my first group of temporary Beverages. As non-insulated conductors in more permanent antennas were added, there wasn't any observable change in inclement weather noise. As before, only the antennas nearest or aimed at my tall towers picked up p-static noise. Antennas located away from the towers remained free of precipitation static, whether bare or insulated wire was used. There is also some chance, if the antenna wire is not under significant tension, that insulation may sometimes hide a broken conductor. 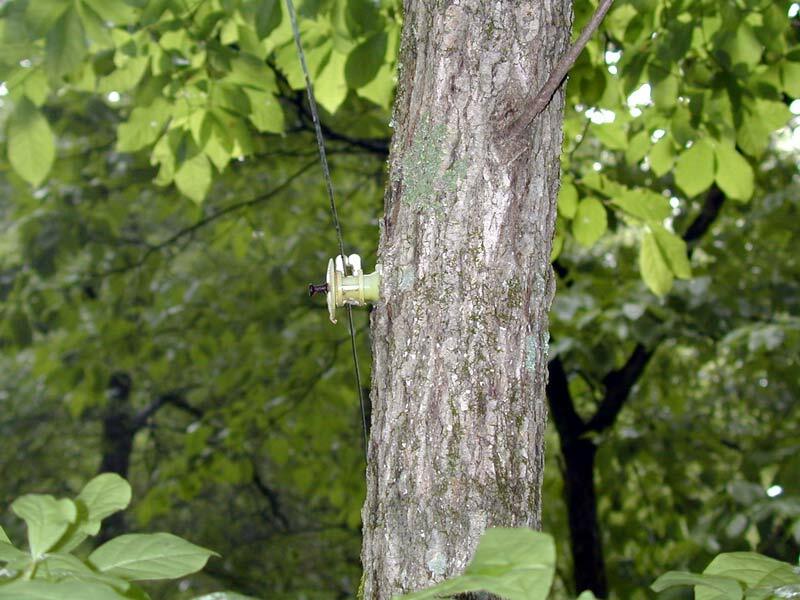 Insulated wire may reduce leakage currents if a substantial part of the conductor is in contact with resistive paths, such as wet brush or tree branches, but you may be better off trimming back any substantial foliage in contact with the wire. While insulated wire has no major performance disadvantage, it also has no advantage. Use it if it is readily available, but don't go out of your way to buy insulated wire. Copper wire is a good choice if supports are close. Pure copper wire lacks the mechanical strength of steel-core wires, but is very easy to work with. It is softer, making it easier to bend. Copper wire can be repeatedly scraped, cleaned, and re-soldered without worries about piercing a thin copper coating and exposing a rust-sensitive steel core. Copper wire is readily available and relatively inexpensive in large quantities. Copperweld wire is much stronger and has about the same RF resistance as 100% copper. Like copper, it is easy to clean and solder after it has been exposed to the weather as long as you are very careful to not scrape through the outer layer of copper. It is considerably more difficult to work with than normal pure copper wire, any small kink or sharp bend will substantially weaken the wire. Most fence wire I've found is cadmium plated, rather than zinc galvanized. Using RF current meters, I have measured increased losses when using zinc or cadmium plated steel wire. 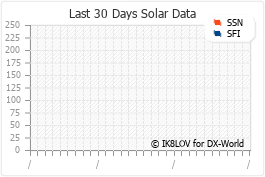 Beverages already have substantial current loss due to the close proximity with lossy earth. I've measured about 60% of feed point current remaining (~4.4dB loss) after passing over around 700-feet of electric fence wire, and about 10% more current (~3.1dB loss) using copper-clad steel wire. Steel fence wire would aggravate losses that already limit the benefits of using long Beverage antennas. In a very long antenna, the small additional loss of steel fence wire might slightly reduce performance. In my Beverages, the important consideration is antenna maintenance. I use copperweld wire or electric fence wire, because strength is a primary concern. With spans exceeding 200 feet, my antennas need a large strength-to-weight ratio. Don't use welding wire! It is a very poor material choice. It rusts (and as with aluminum) you'll have connection problems in no time. Some would have us believe we need non-metallic supports for our Beverages, but there is not the slightest technical justification for using non-metallic support posts. The only requirement for the support is it must hold the antenna up, and it can not connect the antenna to ground. A metal pole with a small PVC stub for an insulator is every bit as good as a full non-metallic pole. 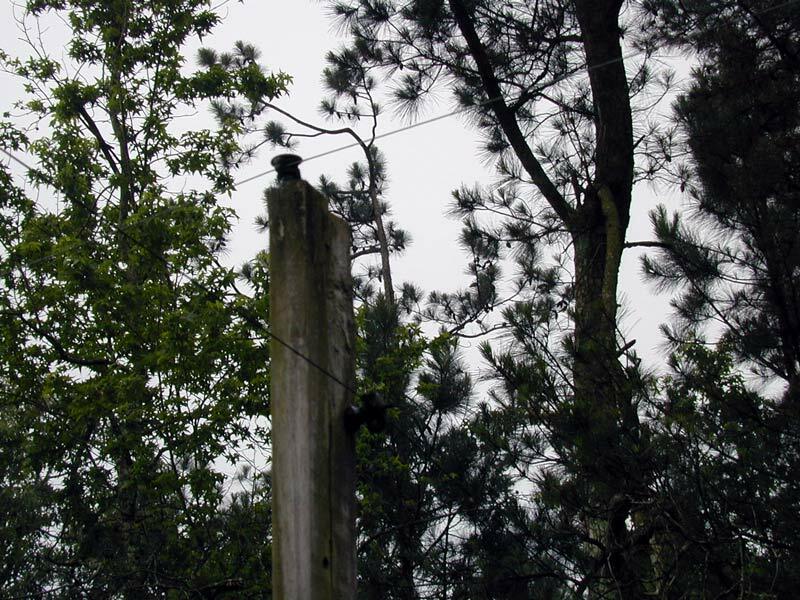 Trees make good supports, especially if you use nail-type electric-fence insulators for use with wooden posts. A typical cross-over point in my installation of over 30 beverage antennas. PVC is wedged over the end of standard metal conduit. The PVC is notched and sanded smooth so the beverage wire can slip freely through the PVC. String may be required to hold the lower wire in the notch. Physical separation is six inches to one foot. I've never seen a problem allowing a wire to contact a branch, although I do trim out the branches and avoid any contact with trees. Notice the wire floats freely through the insulator. This allows a single tensioning point, and easy checking at one point to see if the antenna has lost tension from a break. I never anchor or wrap the Beverage wire around insulators, except at the ends. I always allow the wire to "float" through the insulators. 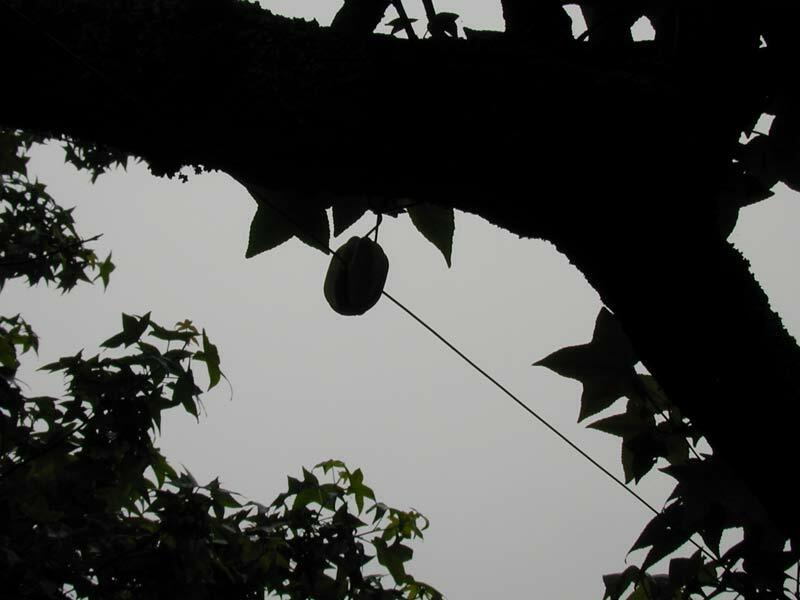 The standard strain insulator hangs from a branch. The beverage wire lays across the insulator webbing, fully floating. Only the hanging wire wraps the web. For end supports, I use trees, pressure treated lumber, or landscaping timbers. With a lot of tension, I backstay the poles to a dead-man (generally an old brick) buried in the ground. When I set end-posts with my power auger, I line the hole with copper flashing. That becomes part or all of the feed point (and termination) ground connection. When the wire floats along the length between ends, you can tension the entire antenna from either end. If anything breaks the wire, you can see it at any point! A "floating" wire is much easier to repair if it is damaged, because you only need release tension on one end to splice the wire. Re-tension that same end, and everything is restored. It takes no more tension to support a 1000-foot Beverage with supports every 100-feet than it does to support a 100-foot wire between two rigid supports, but it is a much more difficult to break the longer floating wire. 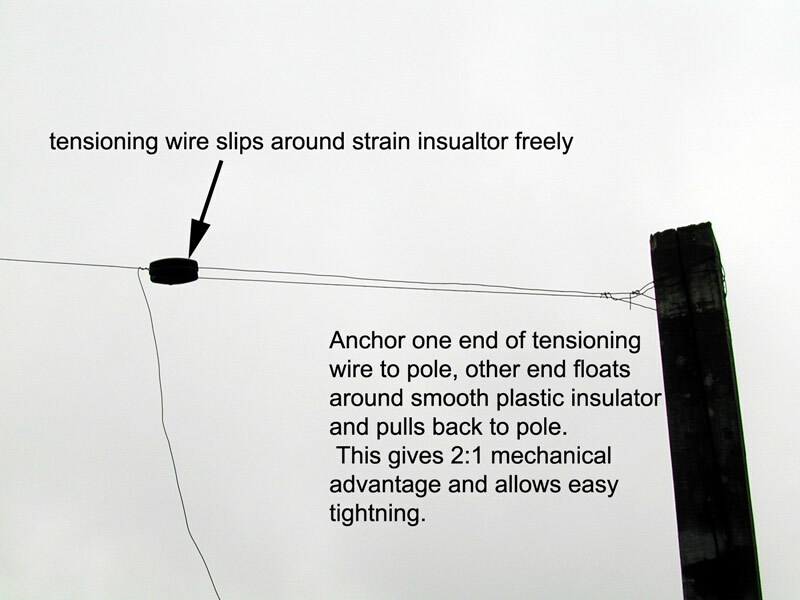 A longer "floating" wire will often take-up enough slack to remain up after deflecting a large tree branch, where a shorter rigidly-anchored span will almost certainly break either the insulators or wire. If you expect a long-lasting antenna and have a long antenna, be careful when choosing insulators! Some types of electric fence insulators will not last long. 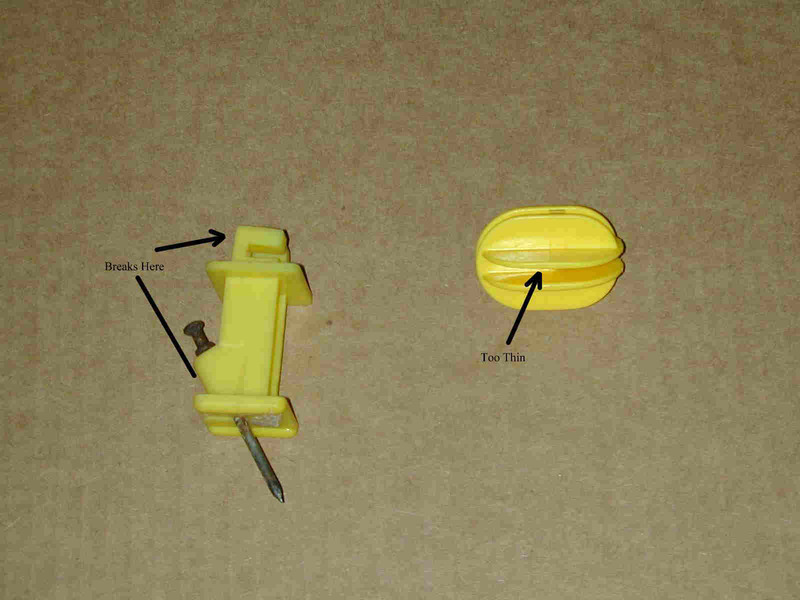 The unreliable types of post insulators have two square folds to hold the wire, a square shaped base, and nail through a small molded plastic angle. The weak points of this insulator are the square retaining tabs, and the molded nail tube at the insulator base. When this type of insulator is mounted horizontally, the wire's weight will stress both the molded nail tube and a single tab. I typically find about 10% of the insulators fail within a few months. After three years, the few dozen installed here have virtually all failed. Ceramic post insulators may look great, but they do not allow floating the wire across the insulator. 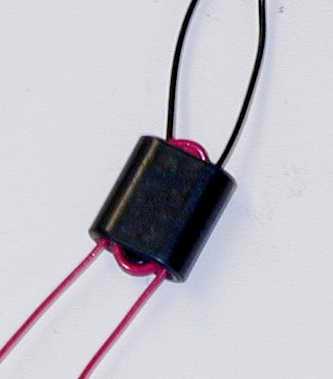 Even if you do manage to find a ceramic insulator that allows floating the wire, the ceramic will quickly wear away at the constantly moving wire. 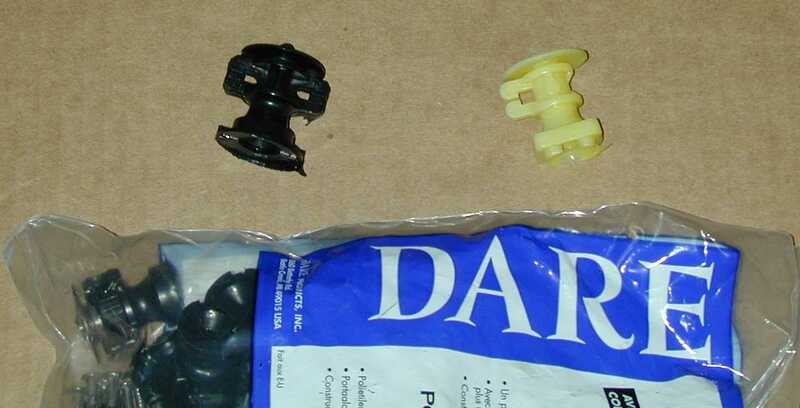 Avoid ceramic insulators, unless you are prepared to "buffer" the wire through a UV resistant soft plastic bushing! Good end-insulators are becoming difficult to find. I always use compression types, but the material has to be either ceramic or very thick plastic. Some very thin plastic compression insulators will actually cold-flow and allow the wire to pass through the insulation. This is particularly true with thin steel wires that are tensioned over 25 pounds. Heavy-walled egg insulators are much more reliable, and not subject to wire migration through the thin insulation. 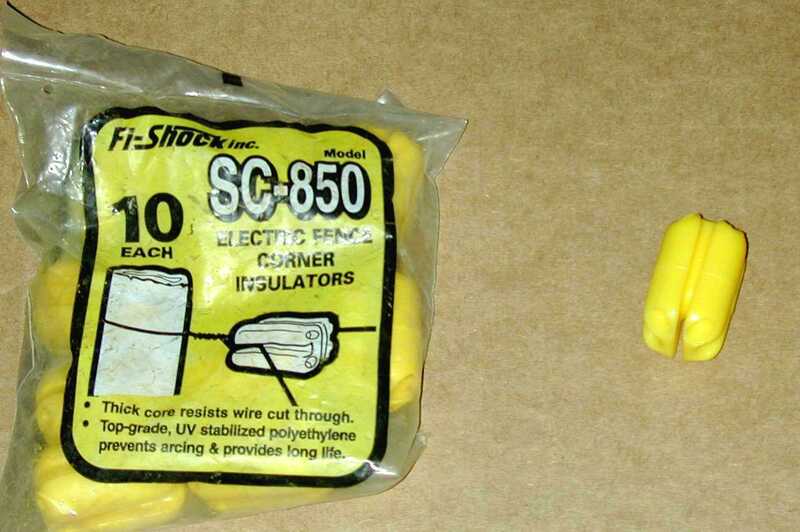 My favorite insulators are large these rather thick Fi-Shock yellow plastic insulators. They are slippery enough to allow the dead-end wire or rope to loop over the insulator, and create a 2:1 mechanical advantage when tensioning. I've found very little performance difference with height, unless the Beverage is more than .05WL high. As the height exceeds .05wl, performance seems to be reduced. Small rolling hills or ravines also seem to make any difference. Follow the contour of gradual slopes, and go straight across ditches or narrow ravines without following the contour. There really isn't a logical reason to slope the ends of a Beverage. After all, six-feet of vertical drop is six feet, no matter if the drop is over 50 feet or straight vertical. Consider, for example, the K9AY or Pennant antennas. 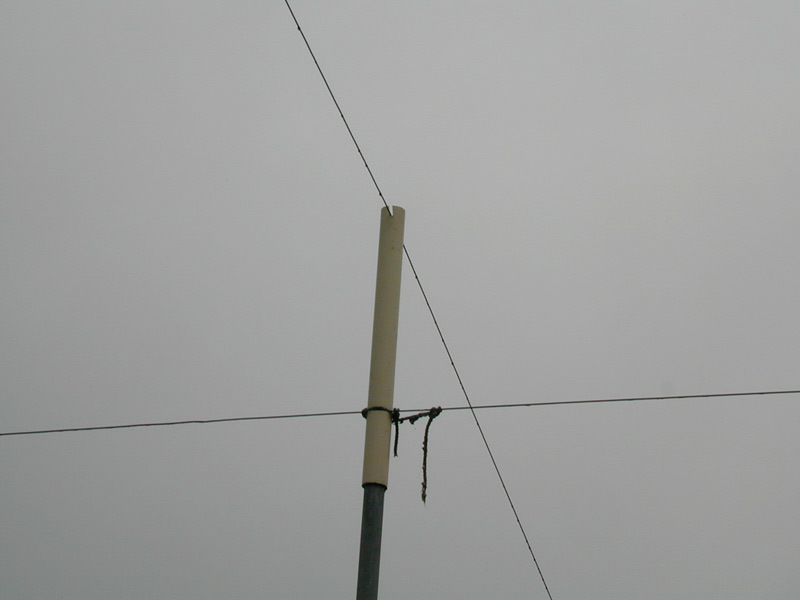 Both have sloped wires, yet virtually all of the response is from the vertical slope of the wire in the antennas. As a matter of fact, the actual shape makes very little difference in the way each antenna works. Why would anyone, knowing how a Pennant or K9AY works, think that a Beverage somehow magically breaks tradition and stops responding to vertical signals in the wires when we slope them a bit? What difference would it make in noise anyway, since the entire antenna responds to vertically polarized signals? There isn't any possible way, including use of shielding or additional conductors, to prevent the end-wires from having the very small effect they have. Save yourself time and worry, and avoid a needless hazard. Just drop the end-wires vertically right down to earth. Crossing of Beverages has little effect if they are not parallel or nearly parallel. Try to cross at an angle of 90 degrees if possible. Even a few inches of spacing is enough for right angle crossing. With shallow angles, assuming they can not be avoided, increase wire spacing to a few feet. Always use isolated transformers for feeding Beverages. It is cheap, simple, easy insurance against unwanted common-mode ingress of noise and signals into the antenna from the feedline shield. See the Common Mode Noise page for an analysis. I use 73-mix FairRite Products 2873000202 cores (about 1/2 inch square and 1/3 inch thick 73 material) in my transformers. These cores require a two-turn 50-75 ohm winding. The high-impedance winding is 5 turns for 75-ohm cables (6.25:1 Z ratio) or6 turns for 50-ohm cables (9:1 Z ratio). Small insulated hookup wire is actually better than enameled wire. The thicker insulation is much less susceptible to developing shorted turns in rough service. While my early transformers were waterproofed with Krylon and coated with insulation foam, I have finally laid out enclosed transformers and terminations with internal lightning protection. The transformer sections have F-fittings, and all use stainless steel hardware. Never bring multiple antennas to one feedpoint, especially when they share one common ground. I've noticed a definite deterioration in pattern with multiple feedpoints arranged with only ten feet of spacing, even when they had separate ground systems. One set of Beverages installed with 5-10 foot of feedpoint separation has noticeably poorer patterns than other identical length antennas with wide separation at the feedpoint. Multiple antennas actually may be the only case where a sloped feeder can make a difference, the slope will actually move the effective feedpoints further apart. 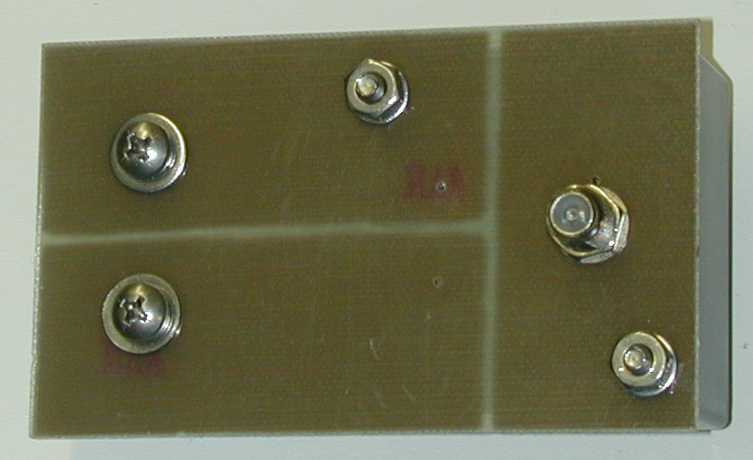 The best idea, however, is to separate the feedpoints by several times the antenna height. Having precise termination values isn't necessary, but get as close as you reasonably can. There are some impedance measurement suggestions circulating that absolutely do not work. One is to just use a tuner to match the terminated (or unterminated) antenna, and work backwards with loads to measure tuner impedance ratio after matching. This won't tell you a thing about proper termination, unless you repeat the measurements on dozens of frequencies spread over a wide range! Apply a small amount of power from a transmitter, do not exceed antenna system component ratings! In about 500-800 feet of distance, power loss in a Beverage is around 3dB. This corresponds to a 1/3 reduction in current. If you attempt to adjust for equal currents (or voltages) over any distance, the antenna will be MIS-terminated! We commonly assume any brown phenolic resistor is a carbon composition resistor, but that isn't true. Most of the smooth brown-colored phenolic cased resistors manufactured after 1960-1970 have actually been carbon film resistors. 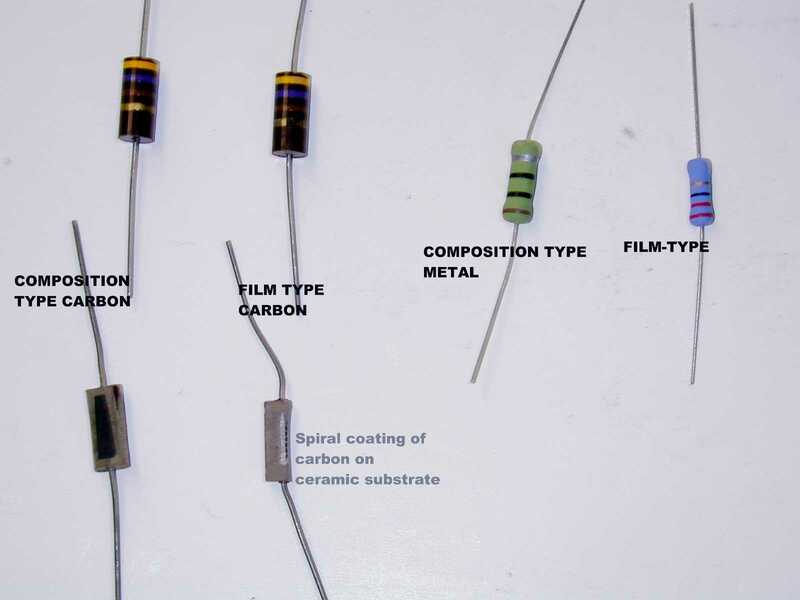 There are only a limited number of manufacturers supplying carbon composition resistors. One is Allen-Bradley. They are expensive special-order parts, and the buyer must specify composition types. As we see from the photo, it is impossible to identify a composition resistor by external appearance. The only sure way to identify a resistor, short of ordering it from a reputable source, is through a destructive test. We can, for example, apply a large momentary overload and look for a resistance change. A resistance change indicates a film-type element. We could also cut the resistor open, and look for a non-conductive core. 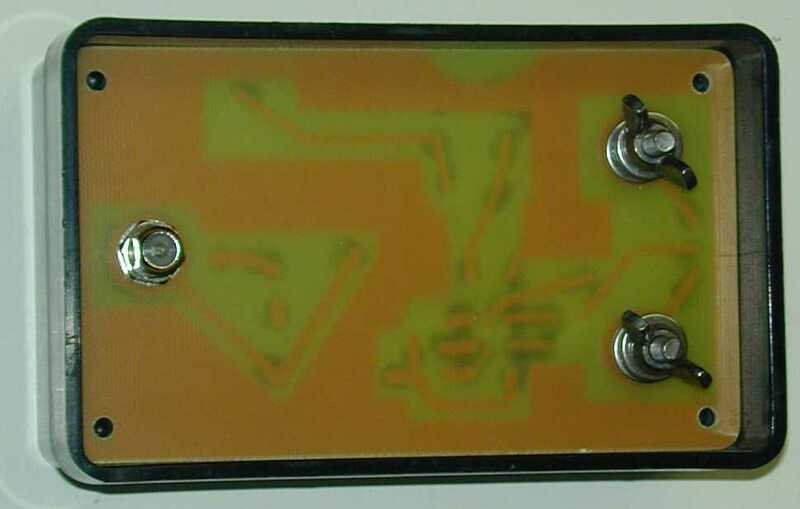 A non-conductive core indicates the resistor is a film style component. We need composition resistors in any application where the resistor is subjected to very-large very-short overloads, or where the system demands a nearly pure resistance at a very high frequency (F>100MHz). Obviously, in the case of a Beverage at a few MHz or lower, we could get away with using many styles of wire-wound resistors or spiral-film resistors. A small amount of inductance would not be a major problem, and virtually ALL carbon or metal film resistors (constructed with resistance elements deposited or cut in a spiral on an insulated core) would not have excessive inductance. The thing we can not tolerate is the sensitivity of non-surge rated components to damage from lightning storms, even distant storms. Unless you want to make a full-time career out of testing your antennas and replacing resistors, use a energy absorbing composition type resistor! I install a small lightning gap of about 1/8th inch across my antenna's ends, both at the feedpoint and the termination. This helps immensely with very close strikes. I use either Ohmite OY-series metal compositions or A-B carbon composition resistors. You can buy metal composition resistors at DX Engineering. 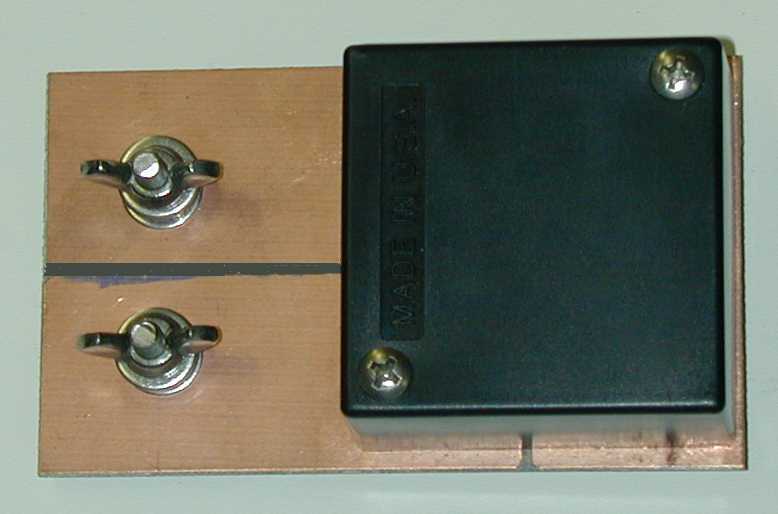 The ground system mainly provides an RF and lightning ground. Having a very low ground-resistance is not especially important, unless an Autotransformer or Un-un is used! Autotransformers and Un-un's don't isolate the feedline for common-mode. The antenna needs a stable ground, not necessarily a low-resistance ground. In my tests over the years, a 3/4-inch copper pipe driven five feet or deeper into the soil typically measures between 50-150 ohms of RF resistance on 160-meters. (DC or low frequency AC measurements will NEVER give the correct earth resistance for RF, and they certainly can not tell us ground conductivity.) Unless you have exceptionally poor soil, going deeper than five feet will not reduce RF resistance on frequencies above 1.8 MHz. Skin effect limits the depth of RF current in the soil, so the extra rod depth does nothing. Lower resistance values (about 55 ohms) were obtained in a wet marshy area of NW Ohio, with a very rich black acidic sandy loam soil. The higher resistance were obtained in rocky clay soil typical of the Atlanta, Georgia area. My present location has rolling pastures and wet clay soils, providing under 100-ohms of RF resistance at 1.8MHz with a five-foot rod. The general guideline I follow is to use at least two five-foot copper rods (I use 3/4" copper spaced 5 feet apart). If I can not get full depth, or if the soil is particularly poor, I add a few 30-60 foot buried radials. The idea is to obtain a reasonably stable ground, so termination does not change. CLICK TO LOOK AT ACTUAL MEASURED GROUND TERMINATION RESISTANCES!!! You can measure the impedance on the low-Z side of a good transformer. Under almost any condition, the wires would have 100 ohms or less impedance. If you see a very noticeable change in impedance, you probably should consider improving the ground system. Impedance changes of 15% (or larger) indicate a potential ground stability problem, because the ground resistance would be nearly 100 ohms. This test should be done when the ground is dry, or any time you think you might be having a ground problem. Always remember to keep the shield of the cable isolated from the Beverage ground! Never use un-un or autotransformers. For length considerations, see the directivity factor text. It is not necessary, nor does it do any good, to go beyond 1-1/2 or 2 WL. By the time the antenna is that long, current is so low any addition length makes the pattern worse. 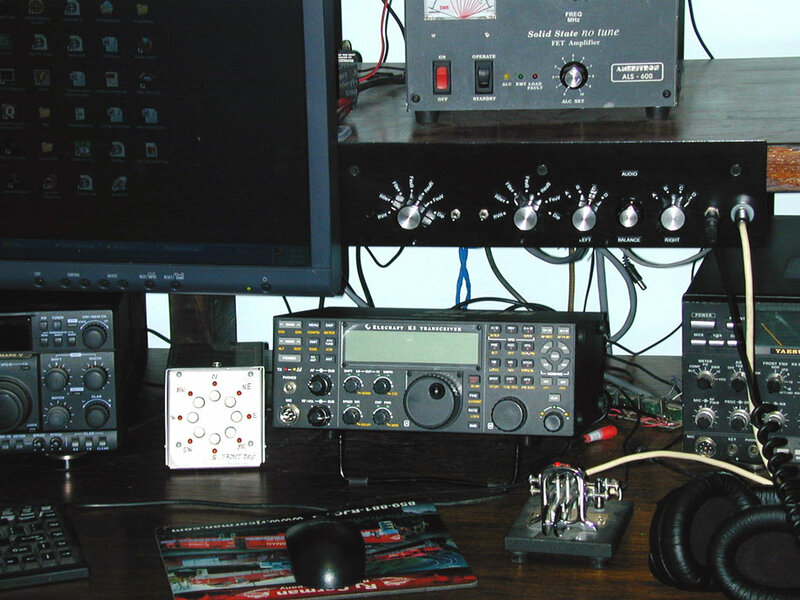 I limit my 160-meter antennas to 800-feet, and use multiple antennas when a sharper pattern is required. Directivity can actually decrease if a longwire-type array is made too long. This is true with Rhombics and Vee Beams, and it is also true with Beverages. While a nice clear straight wire looks great, it does more to make us feel better than hear better! Minor ups and downs in height or dips or valleys don't really seem to have any noticeable impact. Although it probably is a good idea to keep the wire as straight as possible, it is the overall direction and length that is most important because each small area contributes on a similar small portion to the overall directivity and signal reception.